I ran from my brothers to Tara's which is about a mile. Together we ran 7 miles. Total for me, I ran 9 miles. And for the most part, I felt good. It still felt hard, but I felt better than my treadmill run on Thursday. (Maybe I should stop running on the treadmill!!!) Tara and I have only met a few times, but we have been email buddies for awhile so it was really great getting to know each other on the run. I'm excited for next weekend when we can chit chat while running through New York!!! Here are our mile spilts. 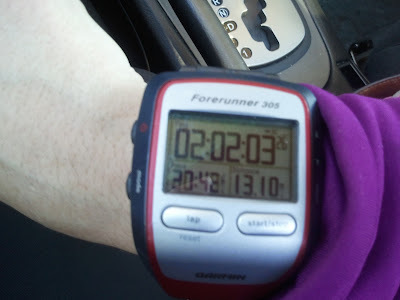 I didn't shut off my watch for the most part, even when we were waiting for lights so the times reflect that. For the most part, I felt good on this run. It was windy out and I was overdressed but it was good. I'm feeling more positive about Sunday. Now it's time to get my game face on. This week I am going to work on positive visualization. I cannot let my negative mind creep in. I need to positive like I was in this post. Here we go... one week, 1 day. Bring it New York City!!! The body does not want you to do this. As you run, it tells you to stop but the mind must be strong. You always go too far for your body. You must handle the pain with strategy…It is not age; it is not diet. It is the will to succeed. Now if you are going to win any battle you have to do one thing. You have to make the mind run the body. Never let the body tell the mind what to do. The body will always give up. It is always tired morning, noon, and night. But the body is never tired if the mind is not tired. When you were younger the mind could make you dance all night, and the body was never tired. You’ve always got to make the mind take over and keep going. 5 Miles. Today I ran 5 miles. Just 5 measly miles. And it was hard. Really really hard. My injuries weren't hurting... the only thing that wasn't working was my brain. I try to be real when it comes to marathon training. It's HARD. I've been running pretty much since the age of 13 and it's really really really hard for me sometimes. My goal was to run 5 miles fast so next week when I run 26.2 at a much slower pace, it won't seem so hard. (haha, yeah right) So my goal was to bump up my pace by .5 on the treadmill every mile. I started slow. 10 minute pace slow. Then I went up to 6.5mph, then 6.7mph, then 7.0mph, then 7.2mph. Then I walked a quarter mile at mile 4 and contemplating quitting for the day. I walked and thought this is supposed to be fun and I really hope next week when I run 26.2 through all the boroughs of NY, it will be. So to all you runners out there, how do you keep your brain positive? How do you keep out negative thoughts during runs? Enlighten me, clearly, I need it. 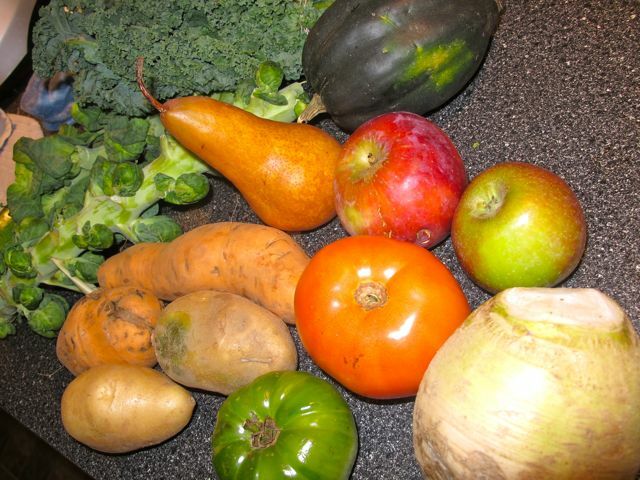 The King Farm - Sustainably grown vegetables. 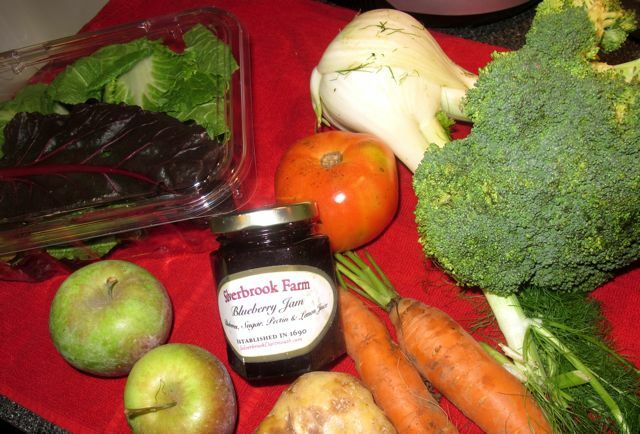 Leafy Greens, Apples, Jam, Carrots, Potatoes, Fennel, Tomatoes and Broccoli. 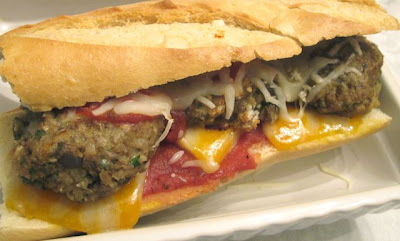 Monday night, I made Meatball Subs, without the meat. 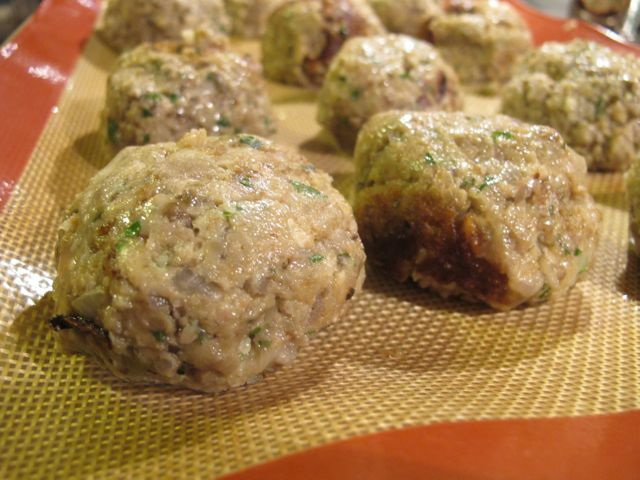 I made the "meatballs" using eggplant, mushrooms and nuts. Sounds creative right? Well don't give me the credit, I got the inspiration from Katie at A Small Boston Kitchen and she got it from Kerry at Cooking Chronicles. I'm always looking for creative ways to eat vegetarian and this was no exception. The meatballs had a crispy outside and were soft in the center. 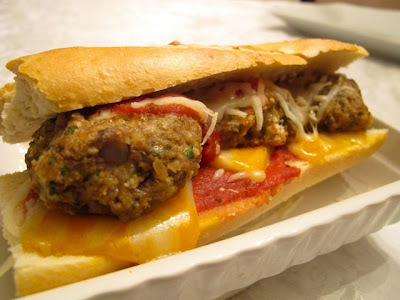 They almooost tasted like meatballs. Almost. (Okay, okay, not really... but they resembled meatballs and my hubby enjoyed them so thats what counts : ). 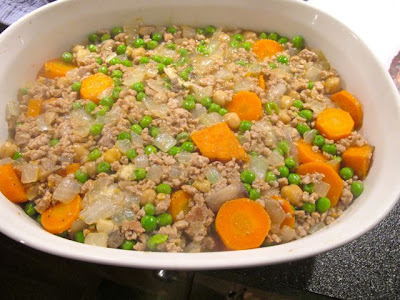 Of course, I looked at both girls recipes, then googled some recipes and came up with this one. Preheat oven 350 degrees. Heat olive oil in a large nonstick skillet or saucepan and cook the garlic over medium heat until golden. Add the eggplant, onions and mushrooms and cook over low heat until very soft, about 10 minutes. Stir the eggplant occasionally while it cooks. 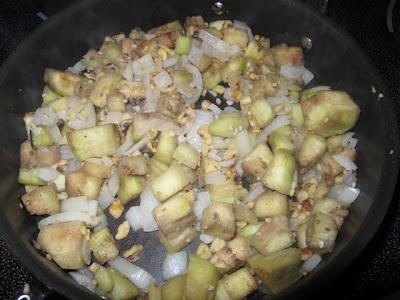 Add walnuts in at the last second. 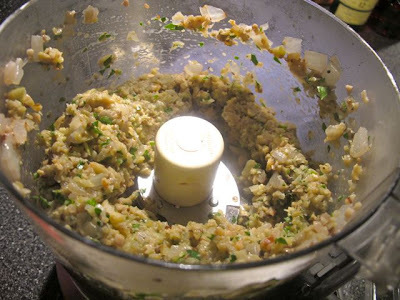 Once soft, add the mixture to a food processor. Pulse to combine. Combine the bread crumbs, parsley, salt, oregano, eggs and cheese in a large bowl. Stir in the eggplant, mix well, and then scoop small amounts of the mixture into your hands and form meatballs the size of a small egg. There should be enough to make about 12. Heat the vegetable oil in a large sauté pan over medium high heat, then fry the meatballs, turning them occasionally so they brown evenly for a few minutes, then place on a baking sheet to finish in the oven. Then slice the baguette, add some sauce, some cheese and three eggplant balls and place back in the oven for 10 minutes or until cheese is melted. I served this with Kale Chips, obvi. "Just took a break and read your blog. Very nice posts. I noticed that the dishes are a bit light on meat. Let's make a fat steak post soon." Preheat oven to 400 degrees. 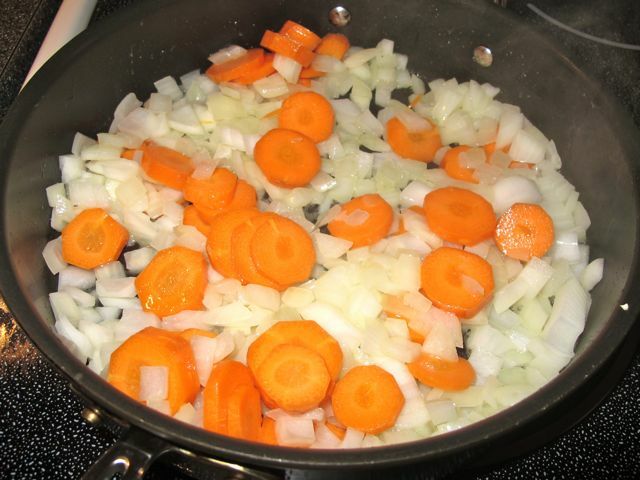 In a large skillet, heat 1 tablespoon of butter, and add onion and carrots. Stir often and cook until the onion is soft. Season with salt and pepper and stir in tomato paste. 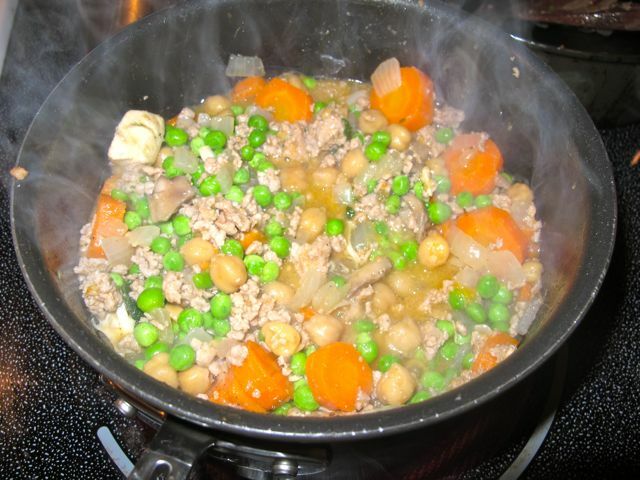 Add meat and cook breaking up with a wooden spoon. Add thyme and beer and bring to a boil. Cook for five minutes then add in the flour. Add some water until mixture thickens. Then stir in peas and season with salt and pepper. Transfer mixture to a 2quart baking dish. Top with sliced potatoes, overlapping the slices. Season potatoes with salt and pepper and drizzle some melted butter on top. Bake until potatoes are browned about 35-45 minutes. 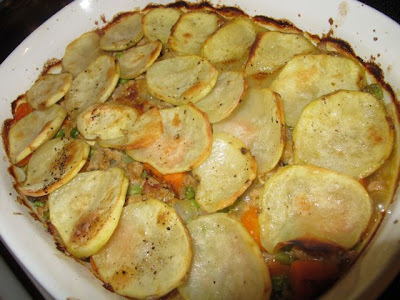 Now, I'm usually not that into Shepard Pie/ Chicken Pot Pie type dishes, but this was so good! I think I liked it better with the pork because pork is leaner. The carrots were so sweet and balanced with the thick sauce, everything tasted great together. I especially loved the "potato" like chips on top! Last night I made Quiche Lorraine Pizza. I saw it on Brown Eyed Baker and was intrigued. 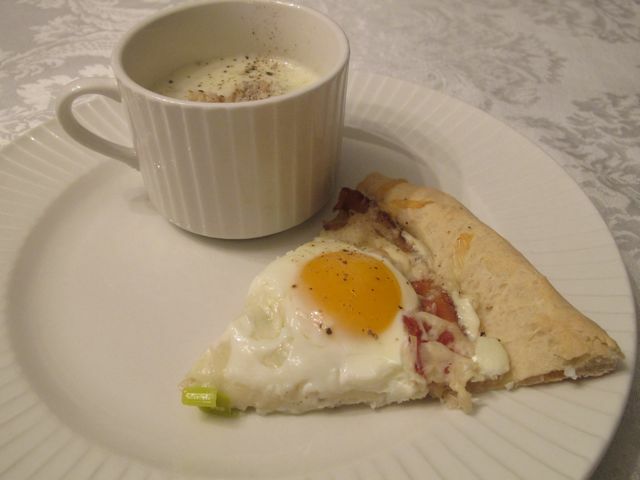 I had leeks I was going to use to make Leek Soup (which I did), but in addition, I added some leeks to a pizza with bacon, cheese and eggs. What could be bad? 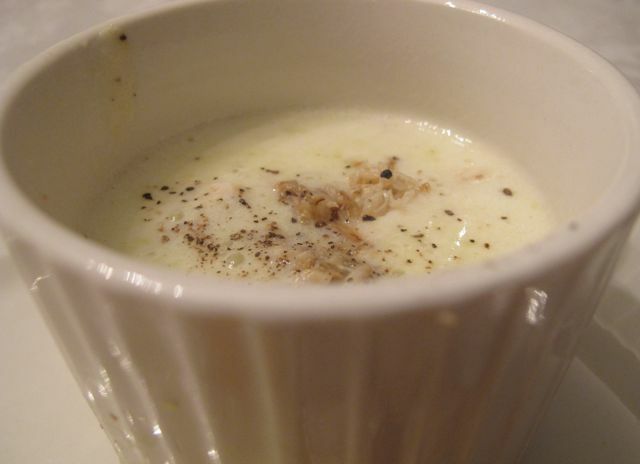 The leek soup is my moms recipe, I have a recipe linked on my recipe page, but honestly, no matter how many times I make leek soup, it's never as good as my mommy's! Preheat the oven to 400 degrees F. While you wait for the pizza dough to rest, melt 1 tablespoon of the unsalted butter in a skillet over medium heat and saute the leeks. Season with salt and pepper and saute until they are soft, about 5-7 minutes. Roll out pizza dough on pizza pan. 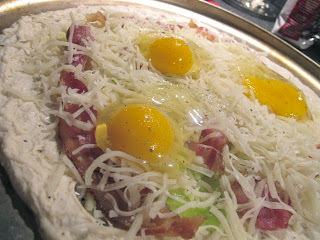 Melt the remaining 2 tablespoons of butter and brush it over the pizza crust. Top with the sauteed leeks, then scatter the bacon over the leeks. Top with the shredded cheese. Crack the eggs over the cheese (evenly spaced) and season the top of the pizza with freshly ground black pepper. Bake for 10-15 minutes, or until the crust is golden and the cheese is melted and starting to brown. Dave had no idea what I was cooking for dinner, he was too busy playing video games. When he took a look at this dinner, he was quite confused. His immediate response "You come up with some weird stuff." 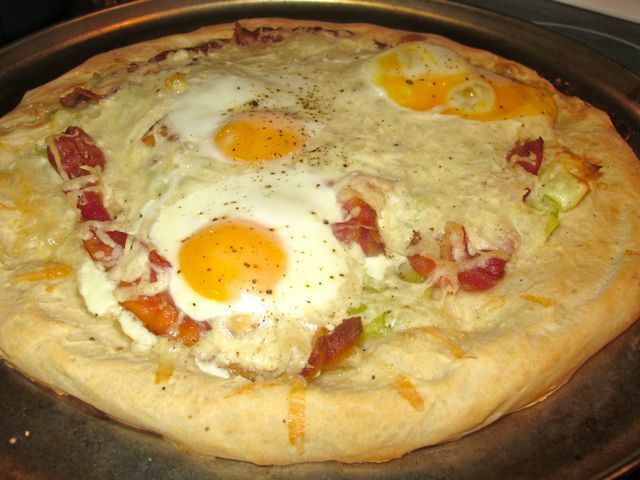 But it's bacon, cheese and egg on a pizza- breakfast on pizza! So that was the dinners for the week! Tomorrow is my last (longish) run of marathon training. Meeting my old intern, Jess's (hi Jess) friend from college for a run tomorrow. Tara is also running NY and we are starting the race together!! Also, tomorrow is Gretchen's 30th Birthday. Go on over to her blog and wish her a Happy Birthday! We celebrated by eating the famous Burgers at Radius for lunch. I think I'm still full from it. (Recap on that lunch and restuarant coming soon) Happy Weekend! As a mentioned in my last post, Lauren over at Pestos with Panache sent me some of her pestos to try out. I was pretty excited! I first broke into the Proscuitto and Smoked Almond. It's awesome! I loved the subtle hint of proscuitto and you could definitely taste the smoky-ness. One of the first things I did was make an egg, cheese, bacon and pesto sandwich when I woke up. First, I toasted my bagel thin and added some pesto. Then I layered a fried egg, cheese, and bacon. This sandwich rocked! For dinner I wanted to make Stuffed Acorn Squash with Proscuitto Smoked Almond Pesto Chicken, Kale, Chickpeas and Cheese. First, I roasted the (cute, small) squashes with a tiny bit of butter and maple syrup. Then I marinated chicken with the prosciutto and smoked almond pesto for a couple hours before cooking it. I also sauteed kale, mushrooms, chickpeas and more prosciutto and smoked almond pesto. Once the squash and the chicken was cooked through, it was time to stuff them! I added pesto chicken, kale, mushroom and chickpeas. Then I added cheese and baked it for about 15 minutes. Preheat oven to 400 degrees. Cut Acorn Squash in half, scoop out seeds and place on a baking sheet. Add some butter, maple syrup, and salt and pepper and bake for about an hour or until the squash is soft. While roasting, marinate chicken with pesto for about a half hour to an hour. Then cook through. After chicken is cooked, add a tablespoon or two of olive oil and add chickpeas, kale and mushrooms. Once everything is cooked/wilted, take out the squashes, add the mixture and top with cheese. Bake for 10-15 minutes until cheese is melted. I know you can't tell, but these acorn squashes were really small so of course I had to make something else! (Plus my mom came over for dinner so I made extra food). I decided to make Pumpkin Pesto Chicken Pizza with the Chilpotle Pumpkin Pesto from Pestos with Panache. First I roasted sweet potatoes and then I cooked about a pound of chicken in pumpkin chilpotle pesto and about a 1/2 cup of canned pumpkin. After that, I rolled out the store-bought pizza dough and spread about a half cup of pumpkin pesto on top. Then I piled on the deliciousness. Sweet potatoes, leftover kale mixture from above, and pumpkin chicken. Then I added the cheese. I used cheddar and mozzerela. Then I baked it at 400 for 15 minutes. Preheat oven to 400. 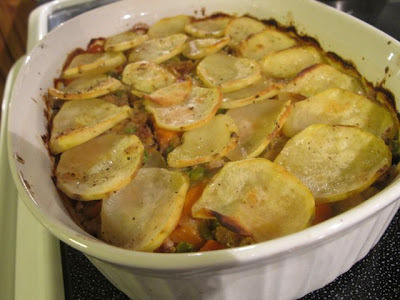 Roast sweet potato in the oven until soft. Marinate chicken with pumpkin and pesto, then saute until cooked through. Roll out pizza and spread pumpkin pesto on top. Add sweet potato, chicken and kale mixture. Then add cheese and bake for 15-20 minutes. Mix together ingredients until well incorparated. Put cupcake holders in your cupcake mold then add mix about 3/4 full. Bake for 18 minutes. Cool, then frost. Enjoy! 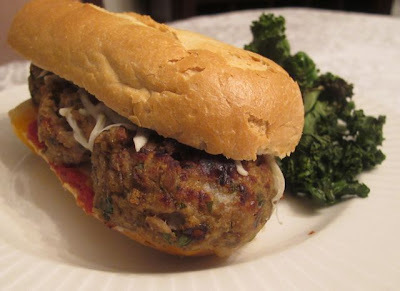 Pestos with Panache by Lauren are absolutely delicious and I enjoyed all the flavors. Cannot wait to try the rest of them. Go check out her website and order your pestos! It is totally worth it. Turn oven on to 375 degrees. Dice onions and mushrooms, shred the brussel sprouts, chop the bacon, and put water in a large pot on the stove. Cook the bacon until fully cooked. Drain out most of the fat and add the butter. Add the onions and mushrooms and cook about 5 minutes. Add the flour and stir constantly then whisk in the milk making sure to whisk out all lumps. 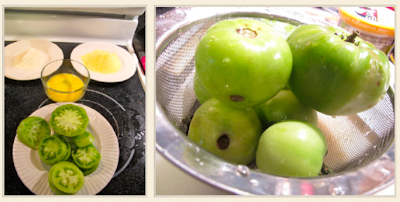 Bring this to a simmer then add the cheese in handfuls, doing figure-eights with your wisk. Mix the shredded sprouts with the Romano cheese, butternut squash and melted butter. Cook pasta about 3 minutes less than the package says. 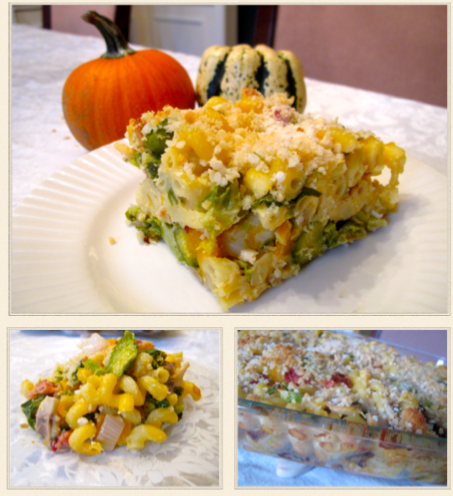 Mix the cooked pasta and the cheese sauce together then add the mixture to the brussel sprout mixture in a casserole pan. Add crumbled bacon and mix thoroughly together. Then mix butter and panko bread crumbs and add on top. Cook for about 30-40 minutes. Talk about a loaded Mac N Cheese. 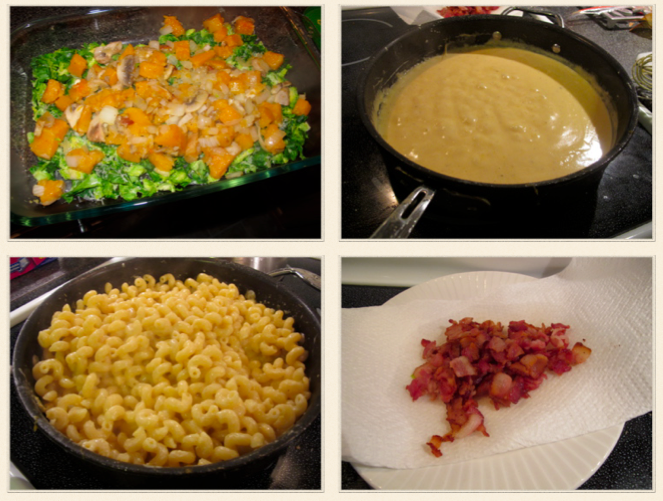 It had a decent amount of butter + bacon, but I also used Fat Free Milk and it was loaded with veggies. This dish was our dinner last night and our lunch today. We will also eat it for lunch throughout the beginning of the week. One big thing I changed, was I used a lot less milk then the original recipe used... I think if I was to make this again, I would follow my recipe again but with half the pasta. 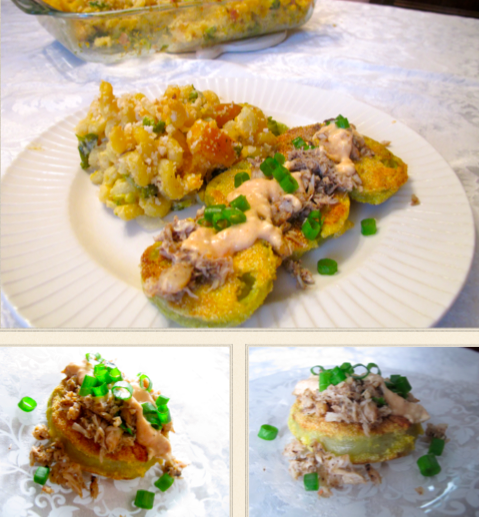 With this dish, I made Fried Green Tomatoes with Crab and Remoulade Sauce. This recipe was almost 100% taken from Closet Kitchen. I got these beauties in my CSA this week. I thought they were green tomatoes, but after looking at Jess's blog- could they be tomatillos? Are those the same? Someone with more knowledge help me out. Season the tomato slices with salt and pepper.Dredge the tomatoes slices in the flour, then dip them in the egg and finally dredge them in the corn meal. Fry the tomato slices in oil until golden brown on both sides, about 1-2 minute per side. I use a tony bit of oil, so to get them golden, I ended up baking them for 10 more minutes. Then I mixed the remoulade sauce ingredients together and cooked the crab meat. I layered the tomatoes with crab then the sauce. Served along side the Mac N Cheese. I loved how sweet and tasty the tomatoes were and I thought the crab and sauce balanced it very well. I also made cupcakes. These are for my dinner tonight- I'm cooking for my mom. This is the worlds easiest recipe and I totally cheated. Meaning, this is half a package of the Dunkin' Hines Spice Cake mix with about a cup of Canned Pumpkin, 1 egg and 1 tablespoon of vegetable oil. Then baked at 350 for 18 minutes, cooled and frosted with store bought frosting. Told ya I cheated. On another note, last night, we got to visit Lillian. My friend Pete and Laura's new bundle of joy. Also, Friday night, I received a package of Pestos with Panache by Lauren. Pesto is Lauren's passion and she has created amazing flavors and I am so honored that she sent me some to review and test out. I am SO SO excited to share with you the recipe I am making (tonight) with this delicious PESTOS! Stay tuned... and GO PATS! This morning, I woke up at 6 and got ready to meet up with a running group from a couple towns away. I haven't been running with them for much of my training, but I am in taper now so I wanted to join. I got there early so I did a mile and half on my own before meeting up with the group. The group runs Tuesday, Thursday and Saturday mornings, generally for about an hour at about 9:30-10 minute pace. They run on the Boston marathon route and through amazing trails and they always have great runs that are different week to week. Right away, I asked if anyone wanted to add on. Walter (who just ran a 1:49 half) volunteered and I was pretty lucky because the route he chose was gorgeous. I had planned on doing the 7 miles with the group, then going back to my car and getting my water. 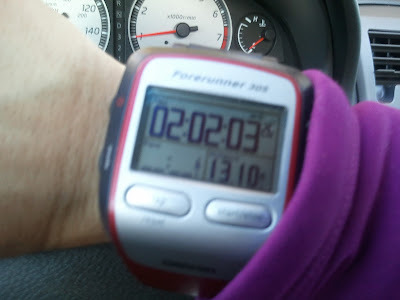 I never ended up doing that because Walter and I broke off from the group at about the 6.5+ mile mark (my 8+mile mark). But... it was so cold this morning that I really didn't need water. 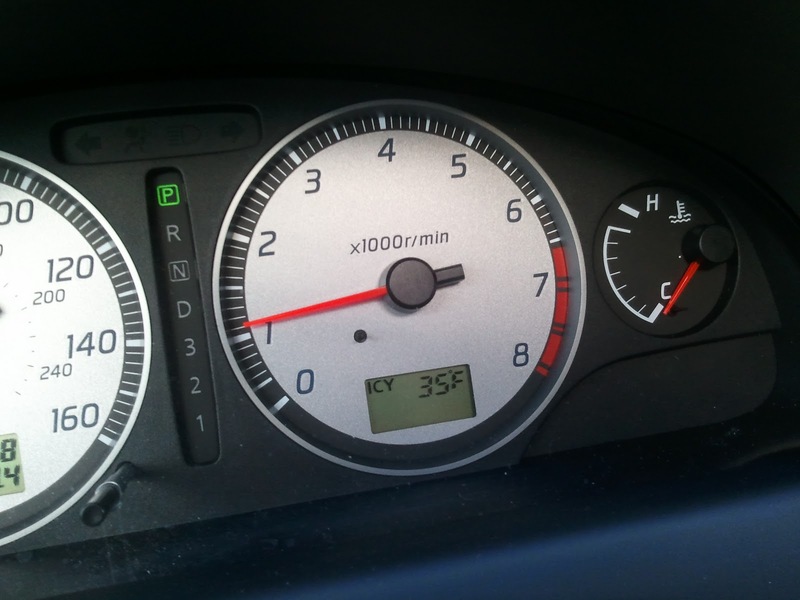 Yes, it was 35 degrees out according to my car. Umm, thats winter time cold! So on September 25th, it was 85 degrees here in Boston and now, four weeks later, it's 35!!!! Good thing I had bundled up (unlike last week). Anyway, enough rambling... here's the splits. So looking at these splits, they are a bit all over the place but there are good reasons for it. One, I ran with a big group. When Nancy and I were leading the group we didn't know where to go so we had to turn back and ask which way to go. Second reason is we were in trails and trails lead to slower times- especially for me! I'm always concerned with not tripping! Walter really pushed me the last 6 miles which was great! Overall, I'm really happy for this runTwo more weeks until NY! And now I'm enjoying my favorite part of finishing a long run... resting in my bed, reading blogs and working on my weekly menu! Oh... and maybe cleaning... enjoy your weekend! This is a Running blog too, right?